The periodic table is an arrangment of the chemical elements ordered by atomic number so that chemical periodic properties of the elements (chemical periodicity) are made clear. There is no one single or best structure for the periodic table but by whatever consensus there is, the standard form used here is very useful and the most common. The periodic table is a masterpiece of organised chemical information and the evolution of chemistry's periodic table into the current form is an astonishing achievement. The standard form of the periodic table shown here includes periods (shown horizontally) and groups (shown vertically). The chemical properties of elements in the vertical groups are similar in some respects to each other. Standard form of the periodic table. Note that the standard form of the periodic table usually has hydrogen (H) located in Group 1 despite it being a gas while the other compounds are metals. The reason for this position for hydrogen is not chemical but electronic; hydrogen and all the Group 1 metals have the electronic configuration ns1 (n is the principal quantum number). In this case helium (He) is coloured yellow as it is located with all the other p-block elements, although it electronic configuration is 1s2. Standard form of the periodic table. Note that the standard form of the periodic table usually has hydrogen (H) located in Group 1 despite it being a gas while the other compounds are metals. The reason for this position for hydrogen is not chemical but electronic; hydrogen and all the Group 1 metals have the electronic configuration ns1 (n is the principal quantum number). In this case helium (He) is coloured blue because although it is located with all the other p-block elements, its electronic configuration is 1s2 (no p electrons..
Standard form of the periodic table. In this case hydrogen (H) located in group 17 as the structural properties of hydrogen compounds are more similar to the group 17 elements than to those of the group 1 elements. Noble gases: He, Ne, Ar, Kr, Xe, Rn, and Og. Coinage metals: Cu, Ag, and Au. 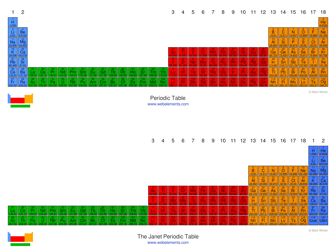 There are many variants of the periodic table, some useful, others less so. A few are linked shown below. Click on the images below to see images of the periodic table in a variety of styles. Many other periodic table formats are catalogued at Mark Leach's Meta-synthesis web site. A classic book showing many forms of the periodic table in print is: Edward G. Mazurs, Periodic representations of the periodic system during one hundred years, University of Alabama Press USA, 2nd edition, 1974. ISBN: 0-8173-3200-6. 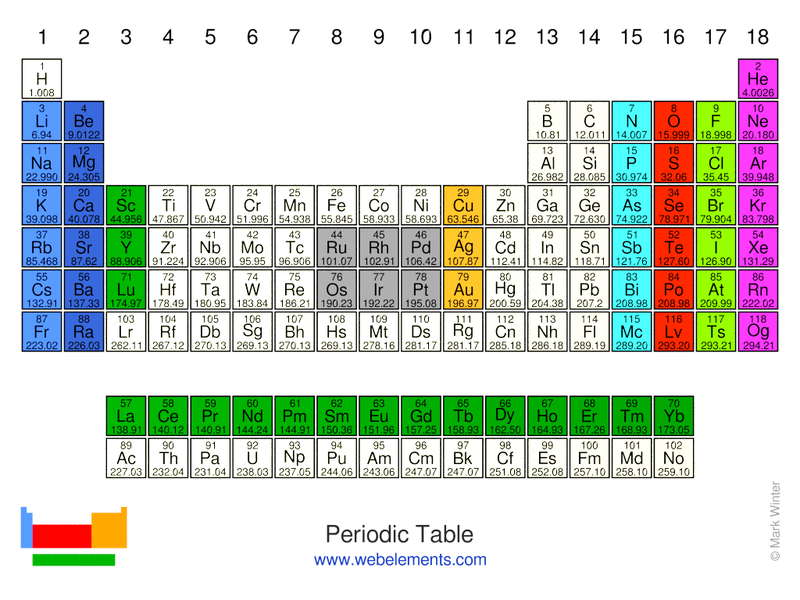 See standard periodic table images. 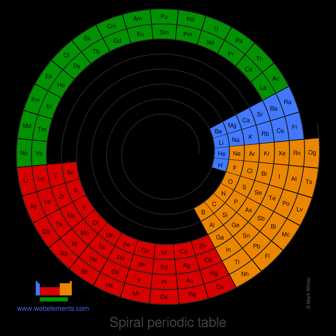 See image of spiral periodic tables. 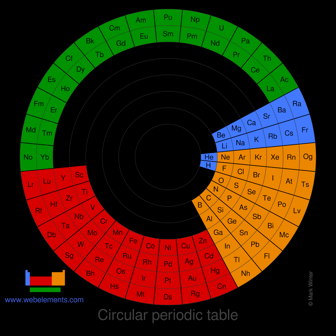 See images of circular periodic tables. See images of extended periodic table. 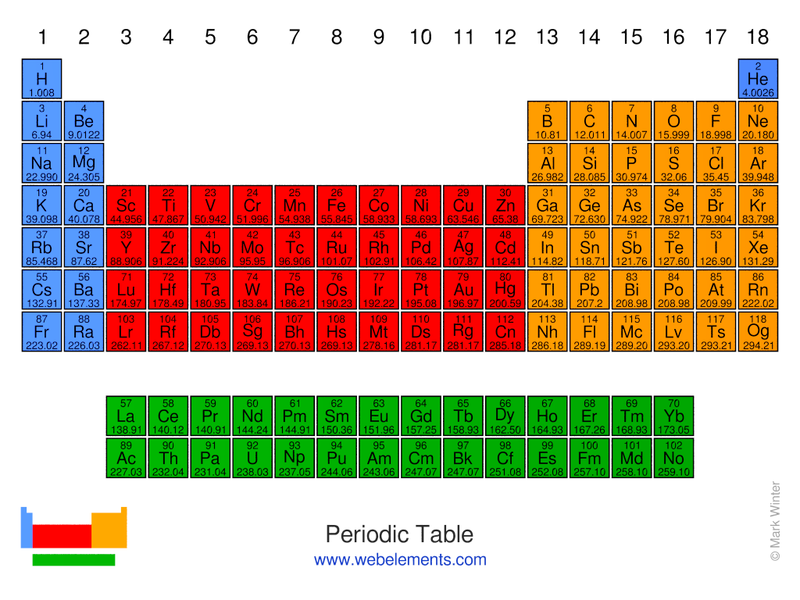 The standard form of the periodic table shown here includes periods (shown horizontally) and groups (shown vertically). The properties of elements in groups are similar in some respects to each other. "WebElements, https://www.webelements.com (last accessed 23rd April 2019)"